May 11, 2015 by Ecommerce News. About Cross-border, Online store with tags Europe. 3743 views. 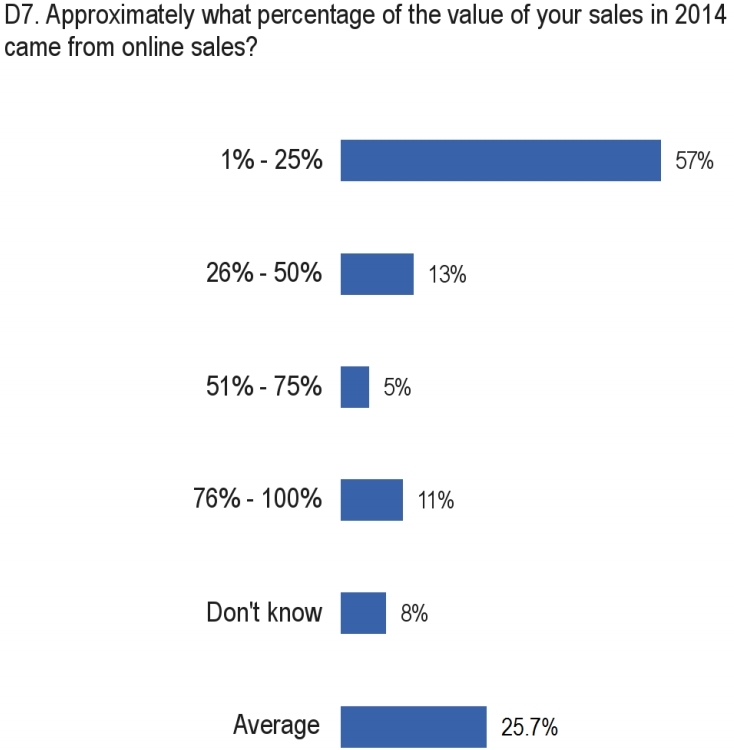 On average, 25.7% of a company’s total sales value last year came from online sales. 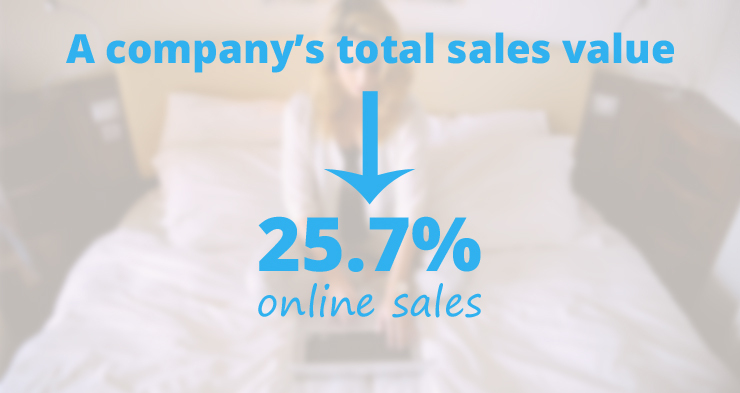 The highest proportion of sales value that comes from online can be found at companies in Northern and Central Europe. 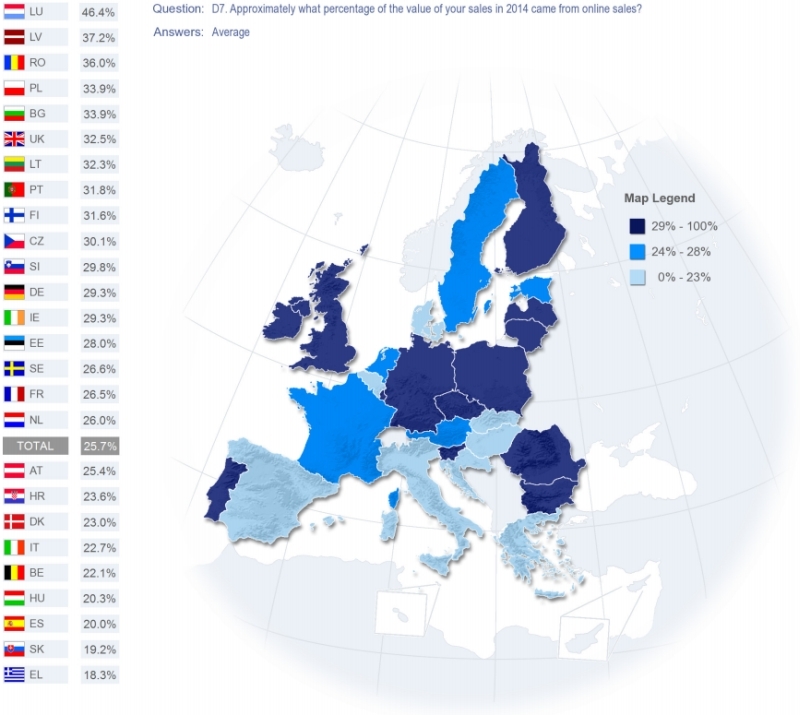 Also, for companies that sell online, an average of 85.4% of their online sales came from their own country, whereas 10.3% were from other EU countries. Businesses in Luxembourg had the highest proportion (46.4%), followed by Latvia (37.2%) and Romania (36%). In Greece, only 18.3% of sales value came from online sales last year, while Slovakia performs slightly better with 19.2%. These are some key conclusions from Flash Eurobarometer 413, a European Commission survey called “Companies engaged in online activities”. It also found out that one in five companies that sell outside their own country, sold products and services to consumers in the USA, while 18% sold to consumers in Switzerland, Norway or Iceland. Of course, there are still companies that don’t currently sell online to other EU countries. But 21% of these companies is considering doing so, although 58% says they probably never will. Companies that sell online encounter several difficulties, of which the most common are related to cost. Concerns about delivery costs that are too high (51%), that guarantees and returns are too expensive (42%), or that resolving complaints and disputes cross-border are too expensive (41%) are the most likely to be mentioned as problems, the study shows. As said, of all companies that sell online, 85.4% of their online sales come from their own country. For companies that only sell through traditional channel, this percentage is 89.3%. Of course, this won’t come as a surprise, because it’s easier selling abroad when you also sell your products and service via the internet. Right now, there are still major problems in the field of laws and regulations in the European Union. But if the same rules for ecommerce were applied in all EU member states, almost six in ten companies would either start of increase their online sales to other EU countries, 23% of which who say they would ‘definitely do this’. For this study, TNS Political & Social interviewed businesses employing one or more persons in companies selling and/or buying on the Internet or using EDI-type transactions (such as XML) in the sectors of manufacturing, wholesale and retail trade, repair of motor vehicles and motorcycles, accommodation and food service activities, and information and communication.